In 2000, there were 81 preventable deaths within the villages of Bong Ti Lung and Bong Ti Bonn. These included malaria cases, TB, babies with their cords cut too short to tie, High blood pressure and bleeding wounds. These were untreated because of ignorance, lack of money, lack of transport and lack of translators. The biggest disease in our area is ignorance. Children are born to 13 year old mothers; some are still producing at 50. Birth control is misunderstood and mismanaged…. maybe we remember, maybe we don’t! So Bamboo school started to seek funding for basic medical help. In 2001 the first car, a Toyota Might X was purchased through funds given by North Carolina Conference.This had a rough conversion into an ambulance/pick-up truck, with an air-conditioned canopy. We taught English (so I could be understood), Thai (so the doctors could understand) and the kids helped patients to get the right treatment. Now we are translating medical pamphlets from Thai into Karen and Burmese languages. In 2008 a small rural hospital was built, with basic lab facilities and a pharmacy. A fully equipped ambulance was purchased in 2012. 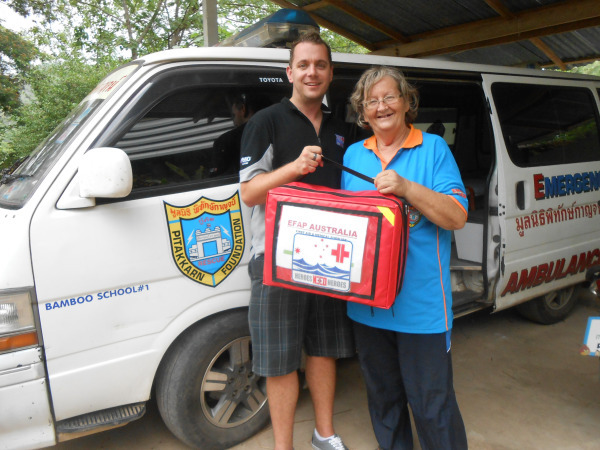 The Pitakkarn Foundation (Rescue of the poor) helped our students with training and supplies. Now we have graduating medical students joining the local health facilities. Malee is working in the local medical clinic at Bong Ti Bonn; Oum is working night shifts at Sai Yok government hospital; Mosa has just completed her nurse training and awaiting appointment. As well Muwai is in his last years at medical school in the Philippines. He will graduate as our first doctor in 2017. The numbers of death have reduced…. and we now offer a coffin building service within the district. Our boys build the “Last Gift Box” our girls embalm and prepare the bodies, and we provide the hearse.